A good year for purple and white prairie clover! 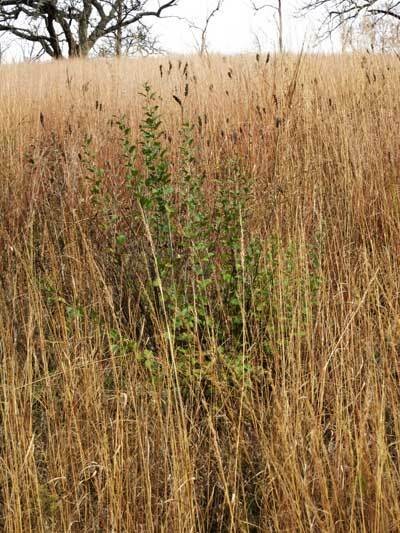 This post is based on 20-years work restoring oak savannas and tallgrass prairie remnants at PVC. During that period, we were able to obtain a lot of experience on the eradication of invasive woody plants, of which buckthorn was the most difficult. See the table at the end for an index to my blog posts that dealt with buckthorn. 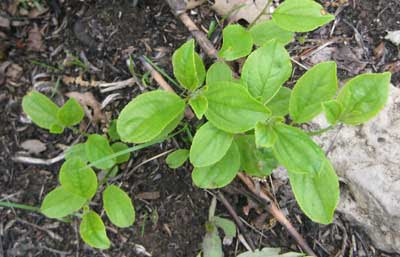 Common buckthorn (Rhamnus cathartica) is the #1 invasive shrub on the IPAW list. When we started serious restoration work at Pleasant Valley Conservancy in 1997, it was present in very dense patches throughout most of the savanna areas. Later I discovered that buckthorn is a calciphile, and was growing mainly in high-calcium high-pH soils derived from or influenced by dolomitic rocks. In many of the calcium-rich oak savanna areas, the understory was almost a buckthorn monoculture. During our major restoration work, buckthorn was removed at the same time as all the other invasive woody plants. Buckthorn removal mainly involved cutting the buckthorn thickets with a brush cutter or chain saw, and treating all the cut stems with herbicide (generally Garlon 3A at 15-20%). Buckthorn was not the only “bad” plant in our degraded oak savannas, but in the calcium-rich areas it was the principal one. The mature open-grown savanna oaks were also being crowded by invasive trees such as walnut, elm, cherry. There were even some “bad” oaks, such as the more rapid-growing oaks of the black oak group, and these were removed also. According to my notes, all of the large patches of buckthorn were removed during the major clearing that took place in 1998 through 2004. Once the savanna areas were cleared, fire was introduced as a principal tool. Although the use of fire was important, it only top-kills woody plants. The underground rootstock remains alive, and quickly resprouts. In fact, there is a strong “legacy” of woody plants in any formerly wooded area. If a cleared area is abandoned, it will quickly become overgrown again. 1. 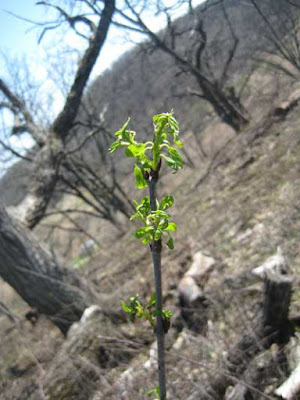 Buckthorn produces a toxic chemical called emodin which inhibits the growth of other plants and prevents “good” plants from becoming established. It creates what we have called a “buckthorn desert”. It generally takes about three years for the toxic chemical to dissipate. 2. An extensive seed bank from the large number of berries produced. (Although only the female buckthorn plants produce berries, the ratio of female to male plants can be as high as 6:1.) The seed bank only lasts a few years. 3. An extensive rootstock (sometimes called a caudex) from which new shoots can arise. It took me some years to realize that the rootstock of the buckthorn can remain dormant from many years. In the earlier years of our restoration work I did not realize the seriousness of the buckthorn problem. (I hardly mentioned it in the new management plan I wrote in June 2005.) It was not until 2006-2007 when we did our major “all-out” push to clear brambles and other woody shrubs that had arisen since the initial restoration work, that I became aware that we also had a buckthorn problem. By this time I had started my first Blog (Tom’s Journal), and buckthorn was a major topic. The table at the end of this document gives links to the various Blog posts. There is a lot of internet material on buckthorn, mostly focusing on getting rid of it. Most of this work is based on short-term studies, or on anecdotal evidence. Buckthorn has a complicated ecology, which enters into a discussion of control methods. Through the 20-year period that I have been following buckthorn I determined that buckthorn rootstock can be long-lived, and remain dormant for many years. Thus, an area that once had had a large buckthorn infestation can have numerous invisible and dormant rootstocks. In order to get some quantitative data, in 2010 I chose a site of about 100 X 100 feet where buckthorn had been removed around 2000 but kept coming back. I canvassed the site carefully and sprayed each buckthorn shoot with Garlon 3A (foliar at 4% aqueous). Most of the plants had only single shoots, but some had more than one. I sprayed all the shoots I could find at each survey. In the three early years, when there were lots of shoots, I returned over and over again at 2-3 week intervals, and sprayed all the “new” buckthorn shoots that had arisen. At the end of each season, I made sure that there were no live buckthorn shoots left. The table shows the results. My conclusion was that in this small, buckthorn-rich area, there were many dormant rootstocks, but not all of them left dormancy the same year. I should emphasize that the original removal of buckthorn was in either 1999 or 2000. Unanswered is what stimulates these dormant rootstocks to start growing after many years? My conclusion is that buckthorn might be eradicated from a site, but it might take many years. Note that the area I studied had been heavily “infected” by buckthorn, and that there was plenty of time for the plants to make extensive underground rootstocks. Sites recently colonized by buckthorn might be eradicated much easier. However, I suspect that most sites in southern Wisconsin that are full of old-growth buckthorn would be similar to my site, especially if they had dolomitic soils. A single buckthorn plant still green after the native vegetation has senesced. Today Pleasant Valley Conservancy is virtually free of buckthorn! This is because we have worked very hard to kill the plant when we see it. Every year, we canvass all sites where buckthorn has been a problem. We are especially helped by the fact that all of the savanna areas, where buckthorn had been the biggest problem, are burned each year. Fire keeps buckthorn at a juvenile status, and prevents any extensive spread by underground roots or rhizomes. Fire makes it possible for us to spray buckthorn shoots when they are still small (foliar spraying is done in the spring). Any buckthorn plants not killed in the spring can be killed when they are found in summer, autumn, or winter by basal bark treatment. The dark shiny leaves of buckthorn plants make them easy to spot, especially in the fall of the year when native vegetation has senesced. What does it cost to cut brush? Final days for buckthorn control?